! They are two of my favorite staples in making dinner! My original intention this evening was to make a BBQ Chicken Pizza. I had found a package of Pizza Crust mix in my pantry, and I happened to have everything I needed to make some delicious pizza. That’s when this soup idea was created. I’ve used pie crust with previous soup recipes (remember this Chicken Pot Pie Soup and this Beef Pot Pie Soup), and it always turns out fantastic. So why not try pizza crust? I love finding ways to make a recipe stretch a little further, yet still be delicious and hearty. You guys. This soup. It fits the bill in so many ways. And did you read above…ready in 30 minutes!! While the soup simmers on the stove top, you can get to work making the easy pizza crust! I used a pouch of Betty Crocker Pizza Crust mix and 1/2 cup water. Combine until it forms a dough, then using the palm of your hand, press it onto a 15 inch round pizza pan (you’ll want the dough to be about 12 inches around). You can also use a package of Pillsbury refrigerated pizza dough (it will roll out into a rectangle, that works too). Once you’ve got your dough pressed, drizzle some olive oil on top and add your seasonings. Bake and cut into bites! 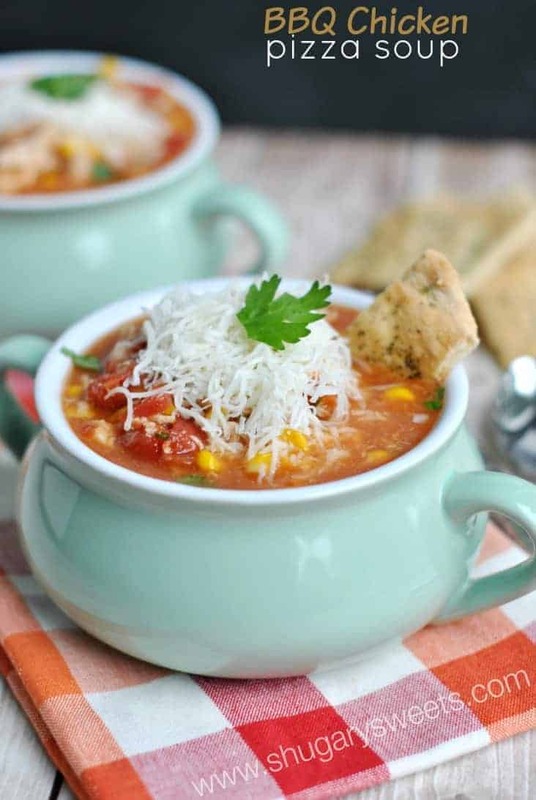 This soup is going to be a go-to recipe on those hectic weeknights this winter! Dinner in 30 minutes with this easy BBQ Chicken Pizza Soup! For the soup, add chicken, corn, tomatoes, broth, salt, pepper, bbq sauce, red onion and 1/4 cup snipped cilantro to a large soup pot. Cover and simmer on medium-low heat for about 25 minutes, stirring occasionally. While soup is cooking, combine pizza crust mix with 1/2 cup water in a bowl. Using a wooden spoon, stir until combined. Dough will be sticky. Press with the palm of your hand onto a large round pizza stone (until it's about 12inch around). Drizzle with olive oil and sprinkle with garlic salt and Italian seasoning. Bake in a 450 degree oven for about 15 minutes. Remove and cut into bite sized pieces. When ready to serve, sprinkle mozzarella cheese and snipped cilantro on soup. Add pizza crust dippers and enjoy! 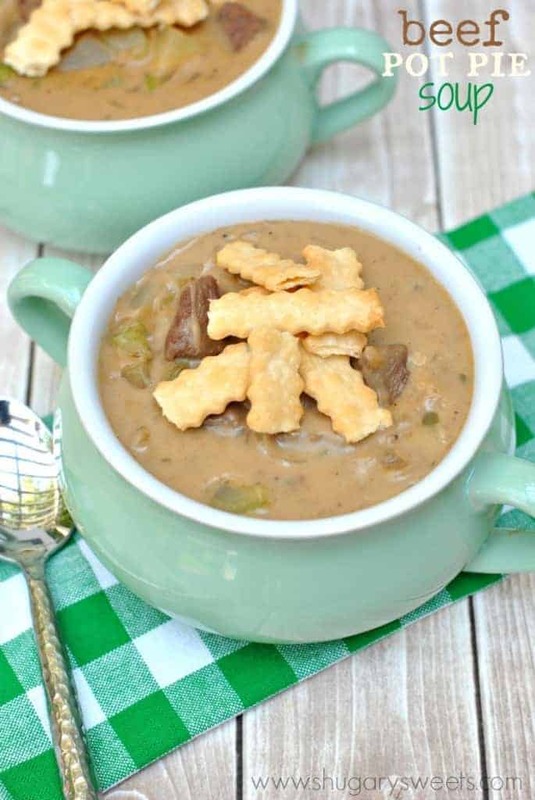 Beef Pot Pie Soup: a hearty stew with pie crust topping! 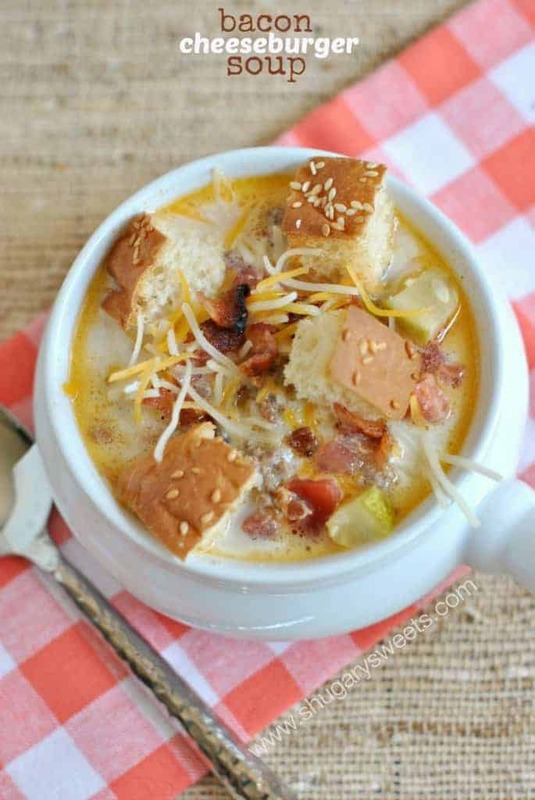 Bacon Cheeseburger Soup: this seriously tastes like the best cheeseburger ever…on a spoon! 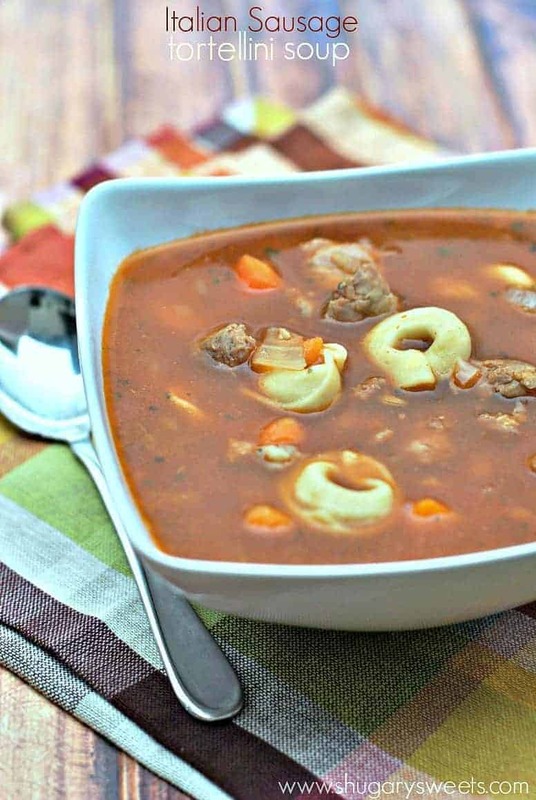 Italian Sausage Tortellini Soup: a hearty soup with TONS of flavor! We order way too much pizza during busy winter evenings. This looks like a filling and delicious alternative! Pinned! You turned my favorite pizza into a soup?! I love it! We’ve got snow in this week’s forecast and I’m thinking I need to make this to get us through it! Yeah, it’s supposed to snow tomorrow. I’m not ready!!! Thanks for pinning Amanda! Love this so much, especially with those dippers. Perfect weeknight meal. You’ve managed to take three cravings and combine them into one healthy meal! Good on you! Loving this idea! 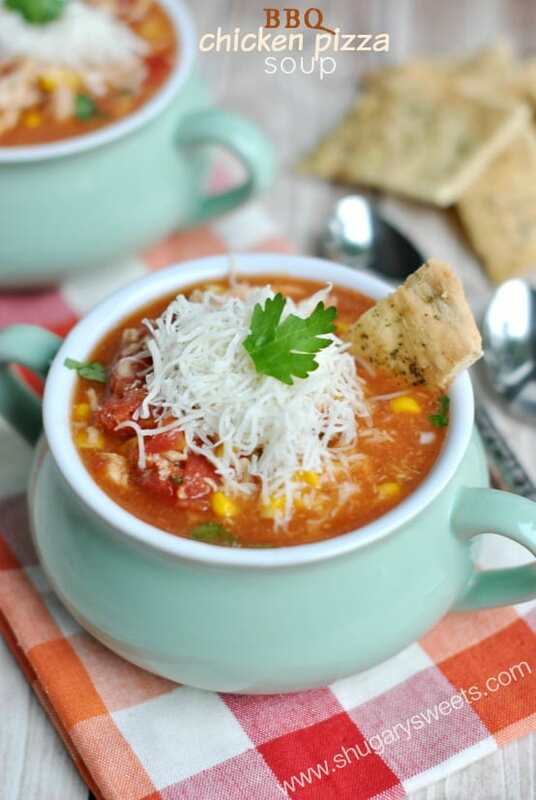 This soup needs to happen! Awesome idea for a soup! I love BBQ Chicken Pizza! I am always trying to figure out how to stretch one meal into two! When we have leftovers we do the same thing, we try to throw it into a soup or over pasta! 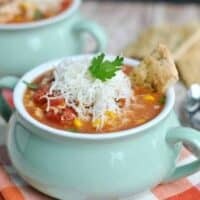 This soup screams comfort food! omg I could eat four bowls of this… comfort food in a bowl! 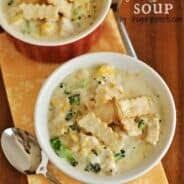 BBQ chicken pizza in soup form??? YES, PLEASE!!! You can never go wrong with soup. Especially one that is ready in 30 minutes. Pinning! I’ve waited my whole life for others to say that to me 😉 haha!!! Love the pizza crust dippers! Such a great weeknight meal! 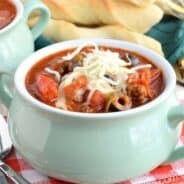 We make a quick and easy pizza soup too, but I never thought about changing out the meat! I will have to definitely try this next time we make it. And of course the pizza dippers are a must! Love those!!! Would you believe me if I said BBQ Chicken Pizza is one of my favorites?! I really really is! 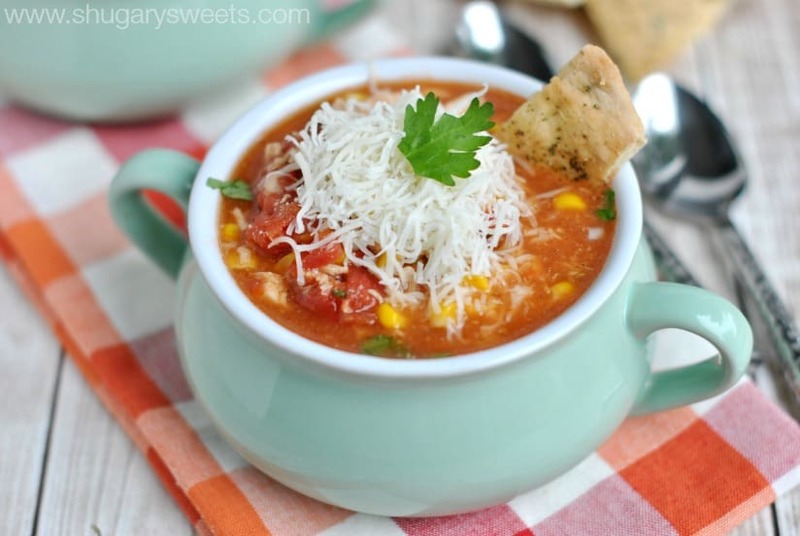 Now I have to make this soup because….. well because it looks amazing!!! I totally believe you! 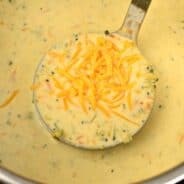 Would you believe me if I said you are going to LOVE this soup?? I’ll send you some of the snow we are expected to get this week. Would that help? hehe! !